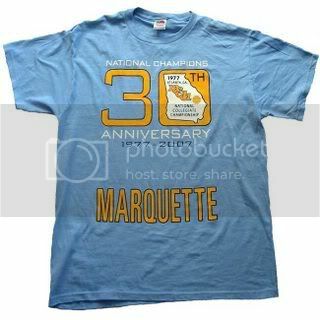 As you may know, MUScoop.com hosts a Marquette Wiki that focuses on all things Marquette Athletics. I have been amazed at the growth of the wiki, as it opened 8 short months ago, and already contains several hundred pages, mostly centered around MU basketball. *You want to know who MU is recruiting for 2007-08? Boom. Here it is. *How about the known information for next year's schedule? *How about Doc Rivers' biography? *You want to know the Cross Country team roster from 2006? *How about the soccer team? *Or maybe you just need the recipe to make your own batch of Real Chili. Ok, ok, there's a lot of great information there. While 2006-07's information is thoroughly entered, we need your help. The ultimate vision is that this Wiki is the best source for MU reference for all years and all sports. Don't know what a wiki is? Basically, it starts as a blank slate and volunteers like you write and edit information into the wiki. Much of this is through cutting and pasting things that are already on the web. For example, all the box-scores for 2006 were graciously entered in their proper places by a dedicated volunteer, cutting and pasting the data into the proper place. But a wiki is only as good as its volunteers! So, I'm running a contest to pique your interest. Hopefully, a series of contests. 1. Whoever adds the most content, wins. 2. Minimum to win a grand prize: 20 chunks or pages. (These are good prizes.) To count, a "chunk" has got to be 3-4 sizable paragraphs or one multi-row table. 3. Any tie will be broken by my judgment of Wiki entry quality. 4. The contest ends around May 1st. There may or may not be more contests, until the prizes are given out. 5. I'm making this up as I go. I reserve the right to dink around with these rules! 1. Dwyane Wade Figurine. Yup. I'm donating one for the cause. Want to write Rick Majerus' bio? Help us out. Know something about the soccer team? Help us out. Maybe you could help us with box scores from 2005? TV shows are going into re-runs. You have nothing to do. Help us with the wiki! Link to MUScoop.com thread, contest rules, and running wiki entries.